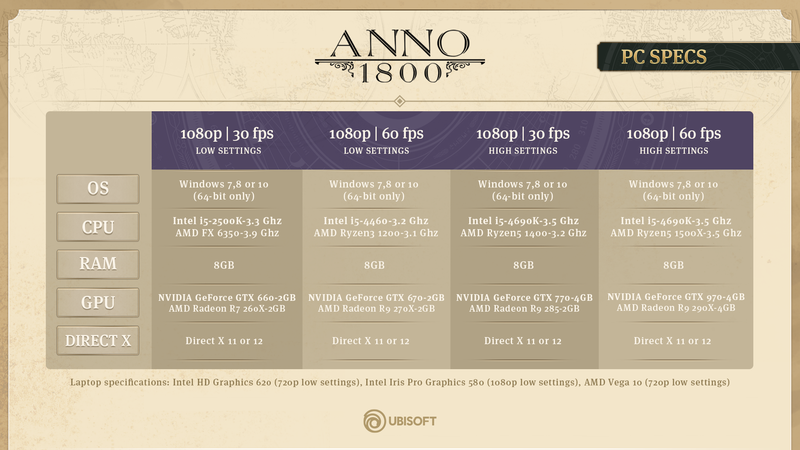 As always with Anno, we strive to support the widest possible range of hardware, allowing as many players as possible to join us on our journey to the 19th century and the industrial revolution. Below you can find our suggestions for some of the most common scenarios in terms of settings and targeted framerate. As always with hardware specifications, your personal results may vary. We have also been hard at work with our friends at Intel to optimize the game for integrated GPUs, and are happy to be able to include some of Intel’s iGPUs in our system requirements matrix, which is a first for the Anno series! We hope that this will allow an even wider group of players to explore the industrial revolution with us.